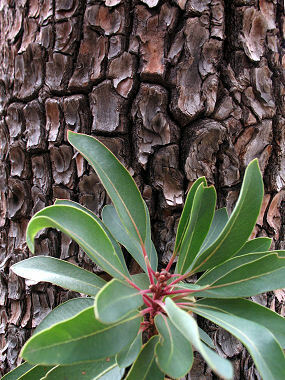 Arizona Madrone is a member of the Heather Family. It can grow to 40 feet in height and 1.5 feet in diameter. It has light gray bark that grows in rectangular plates. Leaves are shiny and light green on top and somewhat lighter beneath. They are lance-shaped and stiff with reddish leaf stems. The tree grows in oak woodlands in the mountains of southeastern Arizona at elevations between 4000-8000 feet. 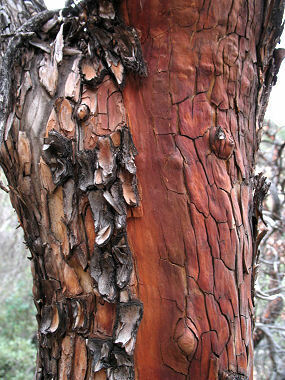 Arizona Madrone is related to manzanita, though the reddish bark is found only on smaller branches. Arizona Madrone blooms between April - September (usually June) and produces white to pinkish, urn-shaped flowers to 0.25 inches in length that grow in terminal clusters to 2.5 inches in length. Flowers are followed by a cluster of orange-red, berry-like fruit to 0.4 inches in diameter.